All the mice you’ll see below were born of the hands of The Curious 13 on Etsy, a seller specializing in “delightfully deceased taxidermy.” And the only thing more incredible than the store’s sheer existence is it’s unyieldingly loyal customer base. The reviews are positively glowing—but of course, you can see why. Extremely happy with my customized taxidermy! 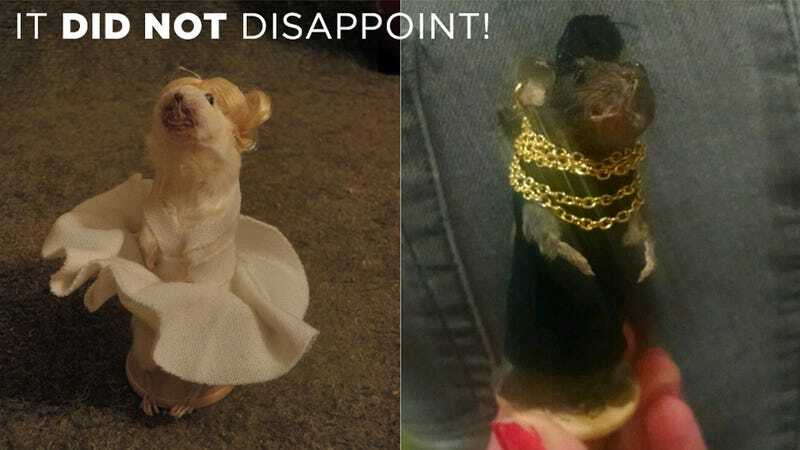 I had her dress a mouse up as an OC as a present for my boyfriend. Seller listened to what I wanted and really delivered! I ordered last minute over the holidays, but the seller was very quick. Don’t see quite the right mouse for you? Never fear. The seller promises that she “can make your custom mouse look like anyone. Wouldn’t your mom look great as a mouse!” Why yes. Yes she would. Mother’s Day is going to be extra special this year.